TRANSIT MATTERS-There is this special relationship between a transit rider and the transit agency, to whom I entrust my transit experience. It’s like a dance – not exactly with two dance partners. It’s more like the transit riders are the dancers…and the transit agency runs the dance hall. We all show up to dance, then it’s up to the dance hall to provide the environment for a good dance. I have attended many dances with Metro, and not all of them have been good. One of the most aggravating moments was trying to put more money on the TAP Card through its old website. This card is used to pay for bus fare, and it’s mandatory as well for riding light rail trains and subways. In a previous City Watch article, I laid out my complete frustration with trying to navigate a website which seemed like it was built by high school students. Actually, that would be an unkind to high school students! This was beyond a bad dance. It was the kind of dance where partners are stepping on each other’s toes because the floor is bad or there is shin-kicking because the lighting is poor. Or maybe the rhythms are wrong, the tempo is off, and then one or both dancers end up in a mess on the floor. And the uncaring dance hall proprietor stays stone silent. I figured that my article would end up with me shouting into the wind, with Fortress Metro ignoring it all. Indeed, in the past we have seen an attitude which seemed to say, “here is what we give you, transit riders, and if you don’t like it, too bad.” Some of their actions showed no forethought on how their actions would affect transit riders; and they seemed too have no afterthoughts about how to correct bad systems and bad judgement. It was take-it-or-leave-it. But when you are a transit rider, you can’t leave it. You have to take it because you need it…if you want to get around this county. However, after my article was published, I was shocked when the head of the TAP division at Metro, David Sutton, contacted me and asked me to meet with him and his staff. I accepted, with a great deal skepticism, expecting typical bureaucratic lip-service and not much else. When I met Mr. Sutton at Metro headquarters, I was warmly greeted by a man who seemed truly interested in my experiences. And he was smart. Before our meeting he showed me around the TAP laboratory. This was interesting, but it was not really an answer to the problems of the TAP system at that time. During the meeting, I expressed my feelings openly, and they listened. Subsequently, I attended more meetings with Mr. Sutton and his associate Robin O’Hara, as well as others from TAP and Metro. With each successive meeting they presented their changes and updates to the TAP system. They explained how they had inherited the angst of generating the TAP program, including the TAP vending machines located at Metro Rail and Metro Subway stations and a website guaranteed to raise one’s blood pressure. The machines could be even more confusing than the TAP website and they were creating just as much frustration for users. The changes made were incremental. I was told that the new TAP department had to live within their means, maintaining the old system and trying to do the best with what they had. Their hands were tied with an existing contract. These meetings went on for a number of months. Finally it was explained that before they could make important changes to the website, vending machines and the entire TAP process -- they had to go through the government procurement process by soliciting bids from the public. Then things went silent. The dance was still going on, but the tune was quiet and the rhythm was vague. To put more money onto my TAP card, I avoided the old website as much as possible and used the TAP vending machines at the stations. This was not always convenient since there is no light rail or subway near to me. My transit riding is mostly by bus, so when I needed to reload my card, and had no rail trips planned, I make cautious ventures to the old website which still had some of the old glitches. It’s still unbelievable to me that the giant Metro organization could have allowed a third-party to produce such a poorly designed website. What should have been an easy transaction was an exercise in frustration and disbelief. Same old website, same old vending machines, same old song, same old dance, same old dance hall. Things were not changing fast enough. Recently, though, I received a general e-mail from Metro announcing the new TAP website…and the start of a new dance tune. I went to the new site, not expecting much at all. But the changes are startling. It is now a mature website that is very user friendly. It’s bright, it’s simple and it’s thought out. It’s a good dance! Shortly on I received an invitation from Mr. Sutton to attend a press conference announcing the new website and new vending machine software. The TAP card is now accepted and integrated with all twenty-six transit agencies in Los Angeles County. 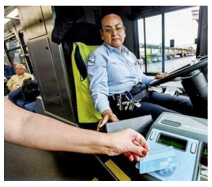 This integration is a tremendous benefit to transit riders who now only need one TAP card to travel anywhere in the county by bus, light rail or subway. At the press conference, Supervisor Ridley-Thomas, Metro CEO Phillip A. Washington, leaders from Metro Board of Directors, and leaders of transit agencies all spoke. There were no speeches from David Sutton or the TAP Department, which is too bad, because they could have outlined the history of the TAP system, and the changes they made. T he end results are a greatly improved TAP System which is designed for, and not against, the transit rider. The new dance is light and bright, with spring in its step. The monolithic, imposing, and silent Metro has changed its tune with a new dance hall and new dance floor. Thank you, David Sutton, Robin O’Hara, Metro, and the TAP Department for listening and making changes for the better. You showed forethought in creating the new website and TAP system. From what I heard at the press conference, there will also be afterthought as you continue to improve the “newly improved” TAP System. As the new “transit dance” evolves, (and there will always room for improvement,) I think Mr. Sutton, Ms. O’Hara and the TAP Department should click their heels and waltz through the halls of Metro knowing they have achieved a great success.